When I was researching my trip to Vienna, the first thing that caught my eye was the Wiener Riesenrad, the iconic Ferris wheel featured in the film The Third Man starring Orson Welles. Shamefully, I've never actually seen The Third Man, but I familiar with it because I studied a play called The Baltimore Waltz by Paula Vogel in university. This particular play references the film and the Ferris wheel. There's even a character called Third Man. Upon seeing this as an option of something to do in Vienna, I was instantly reminded and knew straight away that I wanted to visit the Prater where it's located. The Prater is a a large public park, similar in some ways to Central Park in New York or Hyde Park in London. In one corner of the Prater is the Wurstelprater, an amusement park and this is where the Wiener Riesenrad can be found. Because we went during the day, we walked from where we had breakfast in the morning to the Prater and to be honest, I wouldn't recommend it. The neighbourhoods we passed through were a little rough, though absolutely fine during the day, but I wouldn't fancy walking this route at night or by myself. 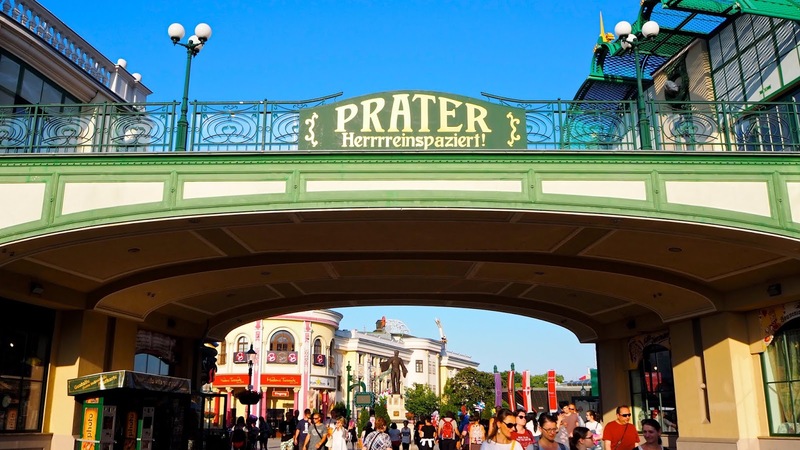 It's actually a lot easier to take public transportation to Praterstern which is just across the street from the Wurstelprater main entrance. The Wurstelprater is an amusement park that's reminiscent of so many I've seen before and yet uniquely Viennese. 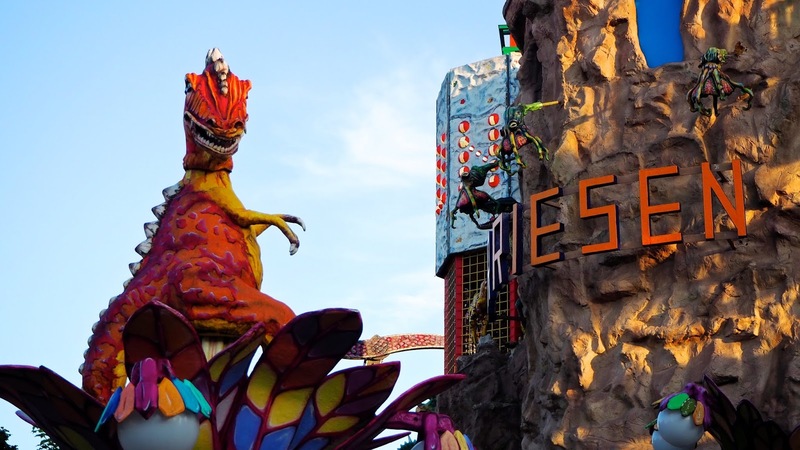 You can see from the moment you enter that so many amusement parks may have been influenced in some way by the Prater from the beer tents to the types of rides available. Before being a public park, the Prater was an Imperial hunting ground, but in 1766 it was opened to the public by Emporer Joseph II. Shortly following the opening of the Prater, snack bars, coffee shops, stalls and other amusements like bowling alleys were opened and marked the beginning of the Wurstelprater. 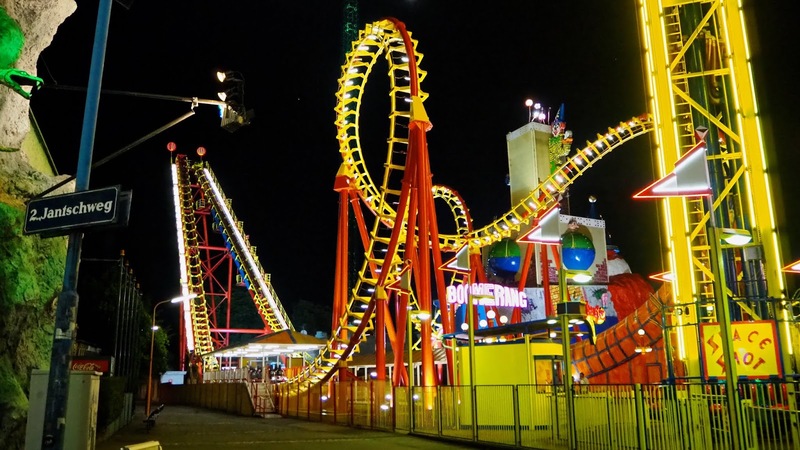 The park now features a wide variety of rides for people of all ages from rollercoasters to bumper cars. Shooting galleries and other carnival games are available throughout the park and there's even a Madame Tussaud's on the property. Traditional Viennese food is available throughout, but you'll also find things like Burger King, which is handy if you need to charge your phone and you'll find plenty of souvenir shops too. Because each of the attractions in the Wurstleprater is an individual business, there's no entry fee but you pay individually for each ride or game you try, similar to a carnival. 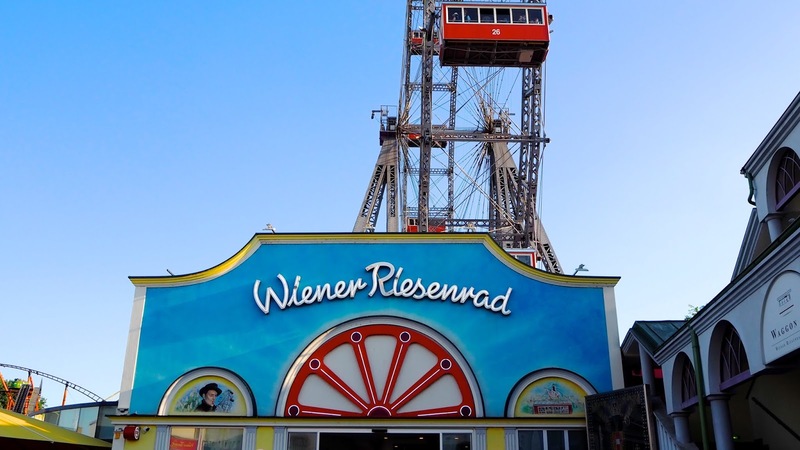 The best known attraction at the Wurstleprater is of course the Wiener Riesenrad, one of Vienna's most popular tourist attractions. 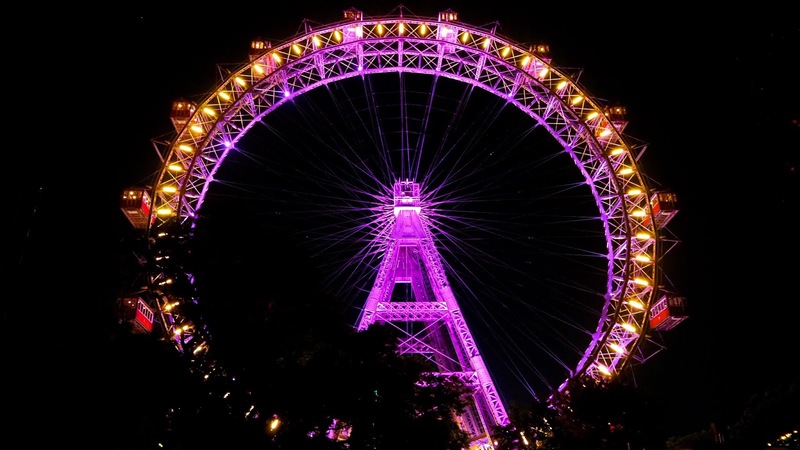 Built in 1897, Riesenrad translates to Vienna Giant Wheel and stands 64.75 metres tall (or 212 feet). 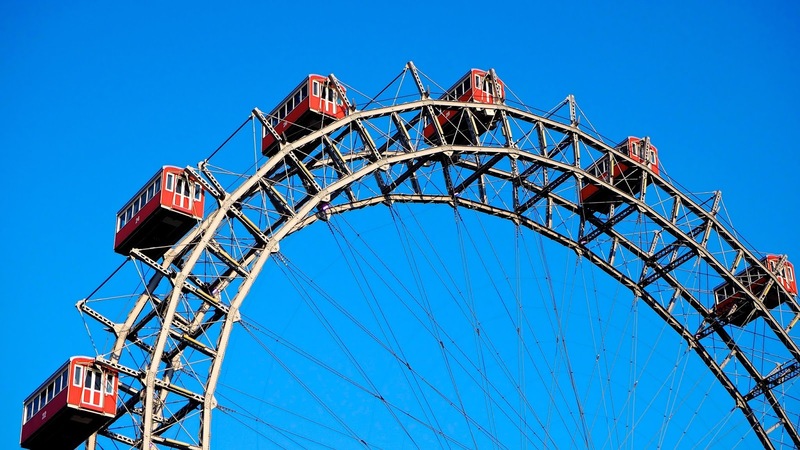 From 1920 to 1985, the Riesenrad was the world's tallest extant Ferris wheel. This record is currently held by the High Roller in Las Vegas, Nevada. 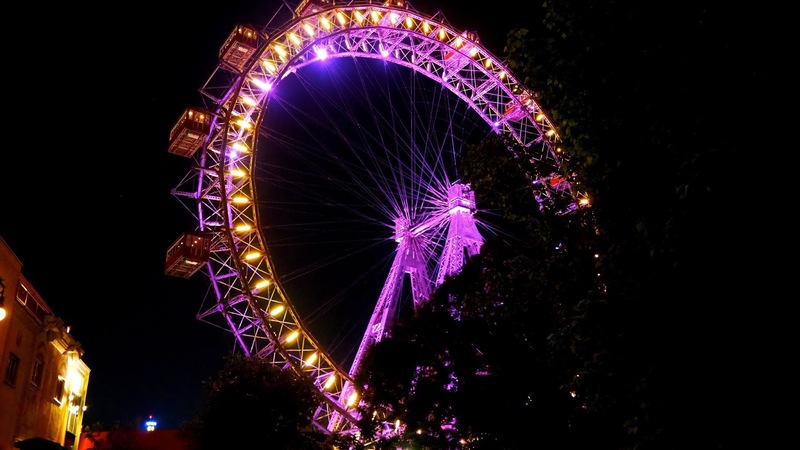 The Wiener Riesenrad may be an iconic part of Viennese culture, but it was actually built by an English engineer, Lieutenant Walter Bassett to celebrate the golden jubilee of Emperor Franz Josef I. In 1916, the famous wheel was supposed to be demolished, but luckily it was spared due to a lack of funding for the demolition. 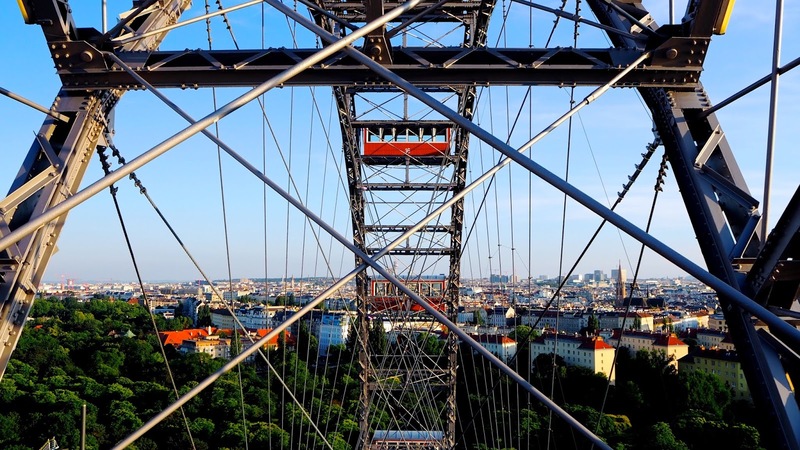 The original Wiener Riesenrad was built with 30 gondolas or carriages however it was damaged badly in WWII. When the wheel was rebuilt, only 15 carriages were replaced. 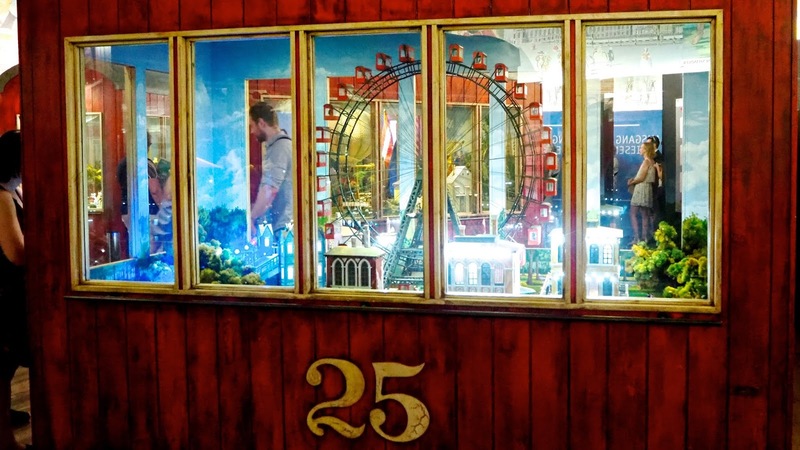 As you enter the attraction, there's a cute little museum with dioramas inside carriages showing the history of the Riesenrad and the Prater. Each carriage has a number on it and you can see from those that there were originally 30 gondolas. The Wiener Riesenrad has become a fixture of popular culture over the years, appearing in films and novels. Most famously the wheel features in an important scene in The Third Man starring Orson Welles who seems to be a sort of favourite son of Vienna. His photograph can be spotted in various restaurants and bars he frequented throughout the city. 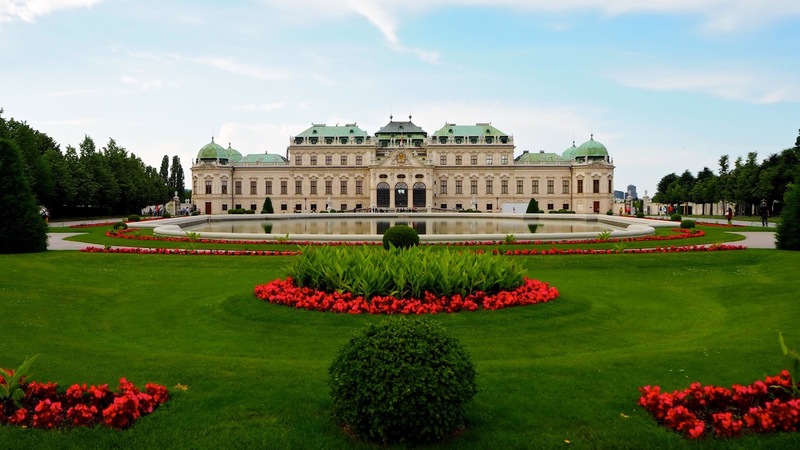 Other notable film appearances of the wheel are Before Sunrise starring Ethan Hawke and Woman in Gold starring Ryan Reynolds and Helen Mirren, which is actually the film I saw a year ago that made me want to visit Vienna. Riding the Wiener Riesenrad is a unique experience. The gondolas are big, have open windows, two benches down the middle and hand rails so you can stand up. If your carriage isn't too crowded (mine wasn't) you can walk around the carriage and take in different views as you please. It does swing a bit and I'd be lying if I said it wasn't a little scary for those of us who are afraid of heights, but the views are totally worth it. It's the most unique way to see Vienna from above and the photos you'll take will be priceless. If you're celebrating something special, there are specialty gondolas available including the cocktail wagon and the Candlelit Dinner car, the Picknick Wagon or the Romantic Crystal Dinner option, both of which serve food & drinks via the kitchen on site. There are also breakfast and brunch options to choose from. These options of course come at a pretty penny, so you'd probably want to be celebrating something rather special and they also need to be booked in advance. 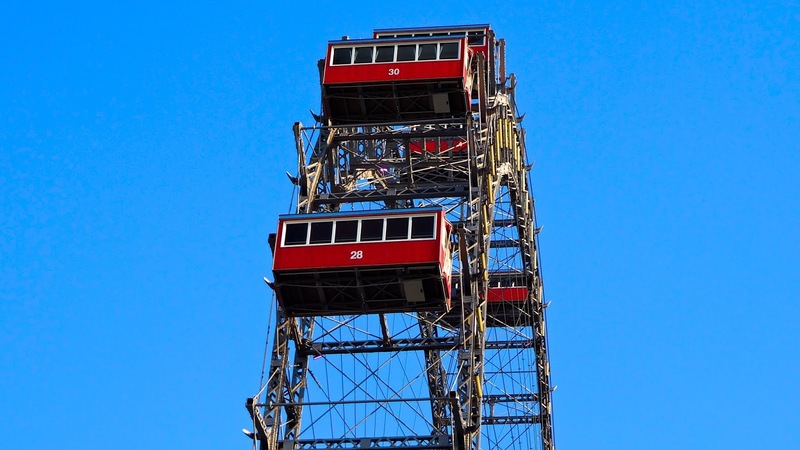 Regular tickets for the Wiener Riesenrad are currently €10 for adults, €4.50 for children aged 3-14 years old and free for kids under 3 years old. These prices are rising in 2019, so if you're planning a trip for next year they will be €12 for adults and €5 for kids aged 3 to 14 years. 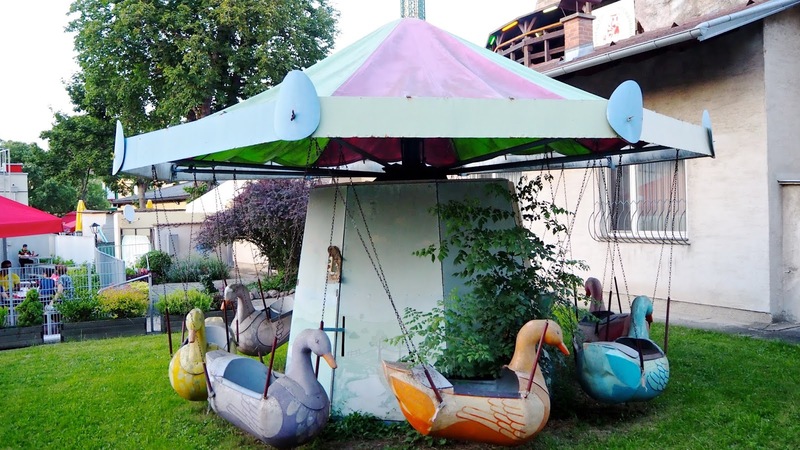 If you walk around the Wurstleprater near the Burger King, you'll find an old, abandoned carousel-style ride with gooses on it. If you look carefully at the scene in The Third Man when Orson Welles opens the gondola door and looks down at the park, this is one of the rides you can see. It's not in operation anymore and I didn't know this information when I visited. I simply photographed the old, discarded ride because I thought it was pretty and unique - like if it could talk, that it would certainly have some stories to tell. It was only when I rewatched the scene a few moments before writing this post that I spotted the dilapidated old amusement I'd photographed in the film, though it looked a bit newer and shinier then than it does now. Perhaps that's why they've kept it on the grounds... Or maybe they've never actually noticed and it's a total coincidence. I intended to only visit the Prater for a couple of hours, but I ended up staying there for most of the day. We started with a relaxing sit-down in the gardens outside the entrance, which was very welcome after our long walk. After riding the Riesenrad which was the first thing on my to-do list there, I wanted to have a bit of a wander. We took in all the sights, enjoyed a few pints at one of the many beer gardens, ate some food and of course, tried out a few rides. The roller coasters were my favourite, however I made the mistake of bringing a bag with me and they're not allowed on many of the thrill rides, but we found one I could take my bag on and rode it a few times. It was too fun to ride just once. We also tried out a fun dinosaur attraction, which to be honest was so cheesy and more like a jurassic haunted house than a ride. There were rope obstacles to climb and various other things to walk through, but it was great fun. The rides are a bit expensive, many of them ringing in at €4 or more per person, but surprisingly most of them were quite long so it didn't feel too disappointing. That said, if you're considering this for a family of four with kids who enjoy a lot of rides, you'll want to come with plenty of cash. The Prater (park) is open to the public 24 hours a day, 7 days a week. The Wurstleprater (amusement park) is open daily during peak season from March 15th to October 31st from 10am to 1am. Many attractions, food stands and restaurants are open throughout the year and some of them have varying hours. During the holiday season, there's a Christmas market on Riesenradplatz. From mid-November to early January, this market offers traditional gifts alongside seasonal food & drinks. Gluhwein anyone? I definitely recommend adding this to your list of things to do if you're visiting Vienna in the near future. It's fun, colourful and exciting, but still offers a bit of history and a uniquely Viennese experience.